Hooray for Fridays!! Last week I was excited because I didn't have plans for the weekend and then I ended up getting plans. I still got some good work done around the house though. Maybe the key is to be busy, but not too busy. Didn't Benjamin Franklin say "If you want something done, ask a busy person." This weekend Frances is having a sleep over at a friend's house, and Ken and I have the boys to ourselves for Friday evening. 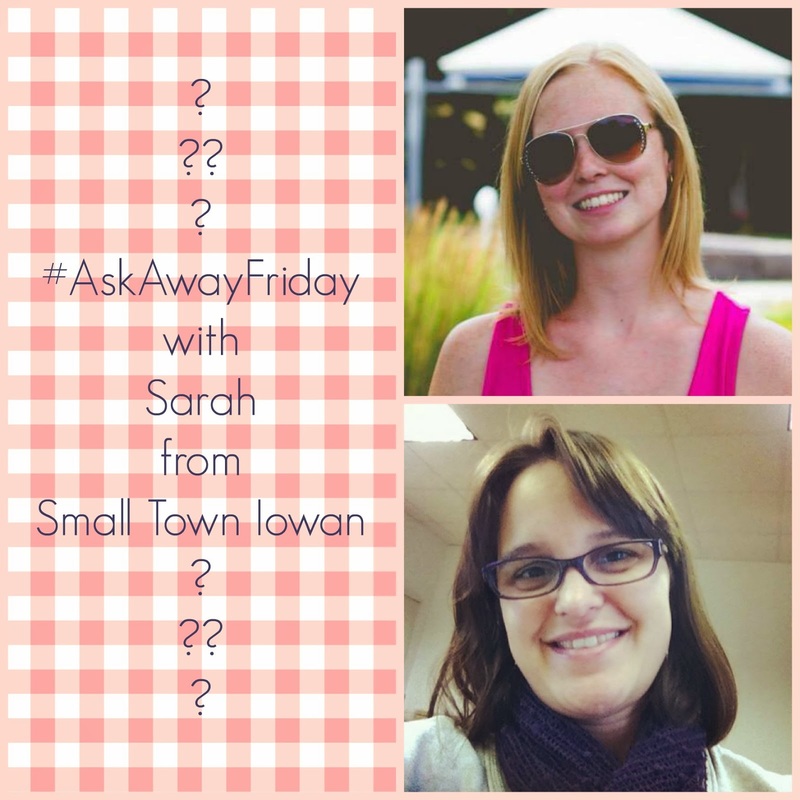 Today I am also pleased to swap #AskAwayFriday questions with Sarah from Small Town Iowan. Sarah is a wife and mom of two darling little girls. We met because of #AskAwayFriday, so I am happy to get to know her a bit better and swap questions this week. 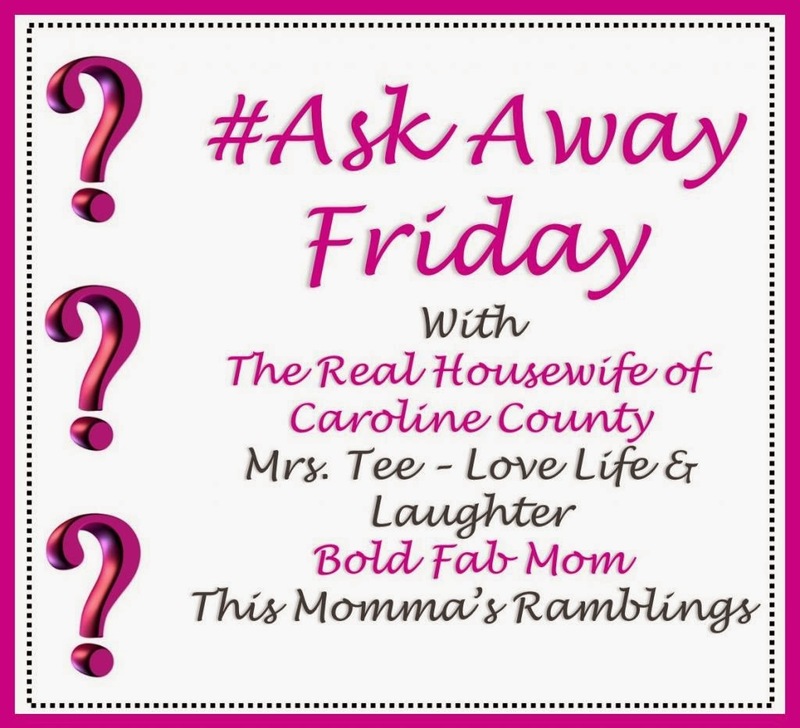 Just to refresh your memory #AskAwayFriday is a great way to connect with other bloggers and learn more about them. Each week you find a partner and swap ten questions to answer on your blog. Then you can head over to the hosts' and link up your post. You can check out my answer's to Sarah's questions below and then you can head over and check out the other posts. In ten years Frances will be 20 and likely in college. Henry will be 16 and learning to drive and finishing high school. Benjamin will be 13 and becoming a teenager. Ken and I will have been married for almost 23 years! Wow! That's tough to look at!! I hope that in ten years we will have moved to a bigger house. I don't want to go too far from our neighborhood, but at this point the kids will all be out of elementary school anyway. I wouldn't mind working where I am now because I really like it here. I guess I don't see a whole lot that will change. I'm not sure if I have a favorite room. I spend a lot of time in my living room, because that's where everything goes on. I should probably show you my favorite corner of the couch. I joke that it has indentations shaped like my rear end because I sit there a lot!! 3. What is one thing you can't leave home without? My phone? I take it pretty much everywhere I go. I have a purse/carrying case for it and those two things usually go together. Lately, I've been working really hard to make sure I have earrings and a necklace as well. I enjoy wearing jewelry and it makes me feel pretty. I don't carry a big purse right now. 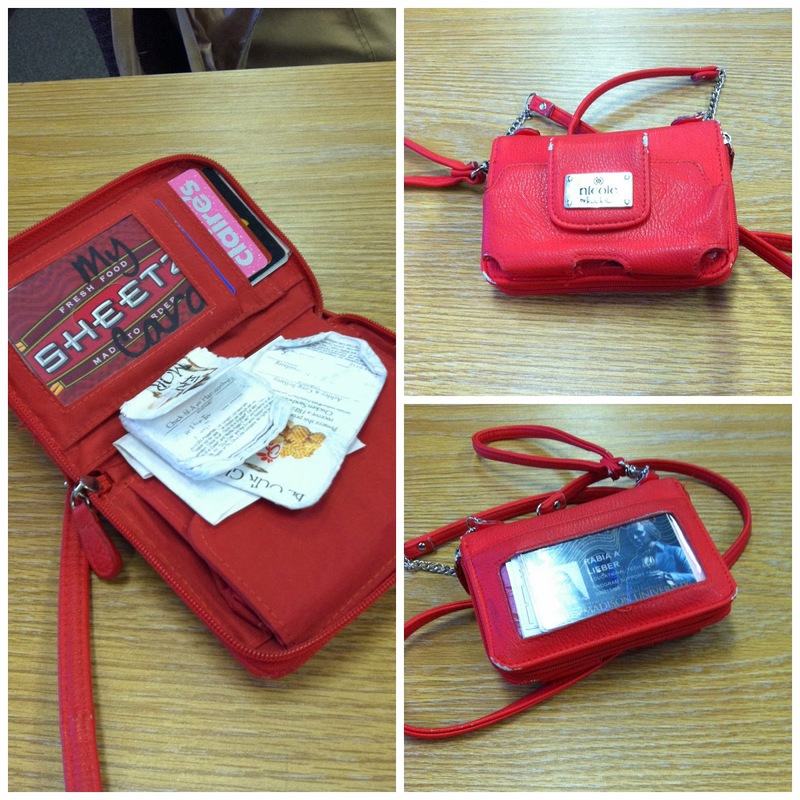 I have a small purse that holds my phone, my ID and my credit cards, along with cash (if I have any!!) I do carry an over the shoulder bag to work every day that has my planner, iPad, and other assorted junk in it. That only goes to and from work though; and it's honestly more of a habit at this point. 5. If money wasn't an issue where would you take your dream vacation with your family? I would love to go to New Zealand. It seems so far away that I can't help but imagine it as exotic. I'd love to go during the American winter, so I could just skip that season altogether! Summer, Fall, Winter in the US Summer in New Zealand, Spring. Sounds absolutely perfect to me! We'd go hiking and snorkeling; we'd have boat trips and lazy days on the beach. 6. You have two boys, what are some of your favorite things to do with them? My boys are both good snugglers. Frances has mostly outgrown it. I like reading to them and being silly with them. Wednesday when I took Ben to daycare he was in a sad mood. I was trying to tease him out of it and I kept telling him to show his teacher his "butterfly gloves." Of course, his gloves have footballs on them, but he wouldn't crack a smile at all. When I asked him about it at pickup time, he called me weird and laughed at me. 7. You have one girl, what is one of your favorite things to do with her? Frances is starting to really ask for girl time. To her girl time is anything that she and I can do together. She likes to go shopping. She likes to play board games or logic games. She's at the age where she's just fun to talk to. She has life experience (not a lot, but enough) and she's got a sense of humor. We also like doing crafts together. I keep meaning to teach her how to knit, but I haven't yet. 8. What does your typical day look like? A typical day for me starts when the alarm goes off at 6:00. Ken gets up to turn it off and then we lie in bed for a little while and talk or try to go back to sleep. Around 6:20 or 6:30 we get up and shower and get dressed. The kids get up at 7 and then we have to start pushing them along. We try to be at the table by 7:15 with breakfast and prayer time, but we always seem to be running a bit behind. At 7:40 Benjamin and I get our stuff together and head out the door. (Ken puts the older two on the bus before he goes to work.) I drop Ben off at day care and then get to work as close to 8 as possible. I work 8-5 with an hour for lunch most days. I work in an office, so I do office-y things all day. I am fortunate that I live close enough to work that I can go home on my lunch hour and get some housework done. After work, I pick up the kids from day care and after-school and then head home. The kids do chores while I get dinner on the table. We eat and then clean up and get ready for bed. Some nights are bath nights and some nights we don't have enough time. The kids are supposed to be in bed by 7:30 so I can read to them, but again, we are usually running behind. Lights off at 8ish and then I sit in their room for a bit so they can go to sleep without bugging each other. After that I usually watch some TV and fold some laundry before I go to bed at 10. 9. If you could have a day to yourself what would you do? I am lucky that I do get days to myself on a regular basis. It's always a toss up whether I'll catch up on housework or just read a book and watch TV all day. I think both are equally important for my sanity!! 10. What is your favorite outfit? I wore it Wednesday and I forgot to take a picture! It's a lot of brown, but I think that's a good color on me. I have a brown skirt that's made out of this great swishy material that's got some good stretch to it. I usually wear it with brown tights and my brown "suede" boots. On top I have an orange/melon camisole and a brown sweater. The sweater is one of my favorites because it has some variegated rainbow threads woven through it and it has two buttons in front. It isn't meant to be fully closed, so it shows the cami for a pop of color. I have several different pieces of jewelry I wear with this outfit and I can't remember what I wore on Wednesday. Thanks for sticking around or all my answers! Remember to check out Sarah's answers to my questions and then take a look at the rest of the linkup!